Wrapped In Two Sided Exquisite Lipstick Colored Italian Foils. Perfect For Valentine’s Day, Sweetest Day, Mother’s Day Or Whenever People Are In Love Or Feeling Romantic. Ideal For Filling Giftware Or Party Favor Items, Balloon Weights, Candy Jars. 1/2 LB – Approx. 30 Lips – Made in the USA – Certified OU-D Kosher. 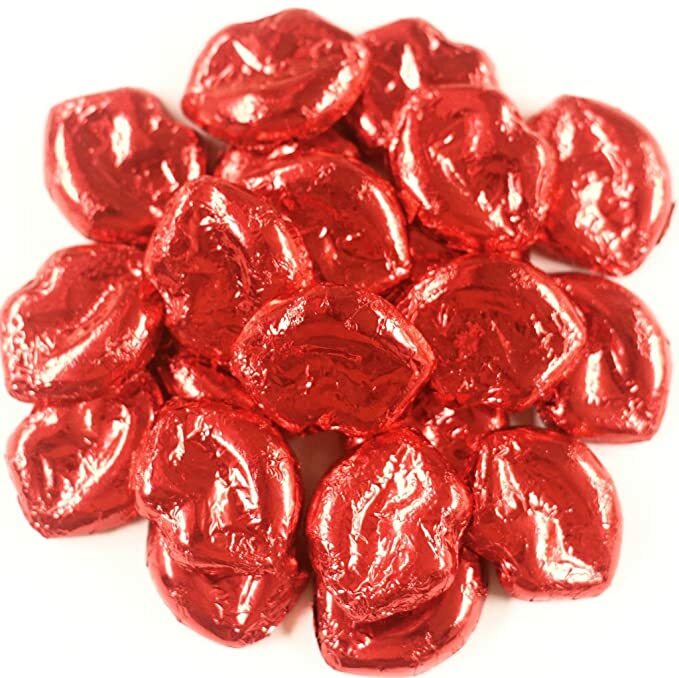 Smooth, Creamy, Solid Premium Milk Chocolate Lips, Wrapped In Two Sided Red Italian Foil. 1/2 LB – Approx. 30 Lips – Each Measures 1 5/16″ x 1 9/16″ x 5/16″ – Certified OU-D Kosher. Perfect For Valentine’s Day, Sweetest Day, Mother’s Day Or Whenever People Are In Love Or Feeling Romantic. Great For Filling Giftware Or Party Favor Items, Balloon Weights, Candy Jars. Solid milk chocolate lips wrapped in extra cute multicolor foils. A Great Valentine treat for your Chocolate Lover! Comes packed in a plastic deli container. Solid milk chocolate lips wrapped in extra cute red foils. Comes packed in a white bakery box. 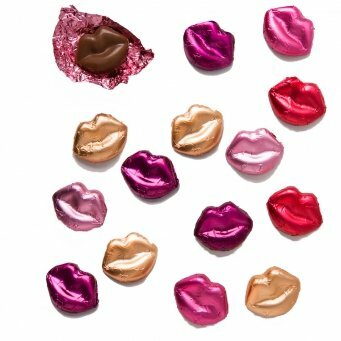 We personally hand foil wrap each chocolate smooch lips. Smooch lips measure approx. 2″ wide x 1.5″ high at the middle of the lip. 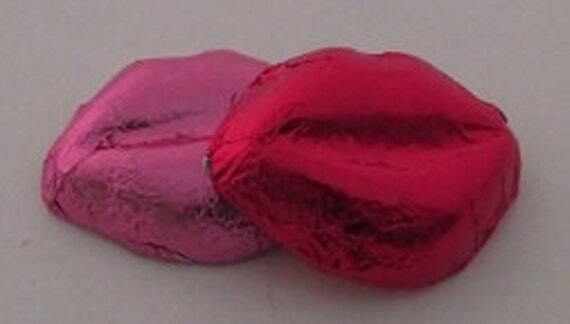 They are sold by the pound, approximately 26-28 foiled smooch lips chocolates per color and per pound. Available in milk chocolate, dark chocolate or white chocolate. 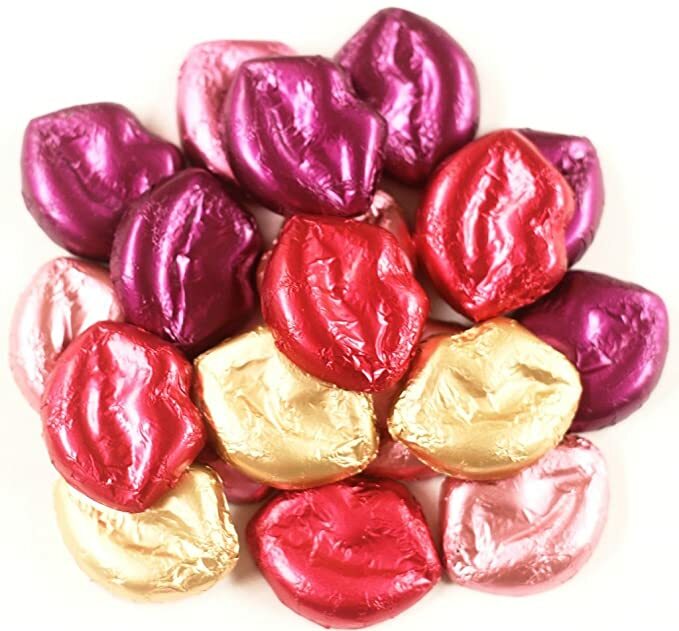 Mix and match foil colors within the one pound bag not available. 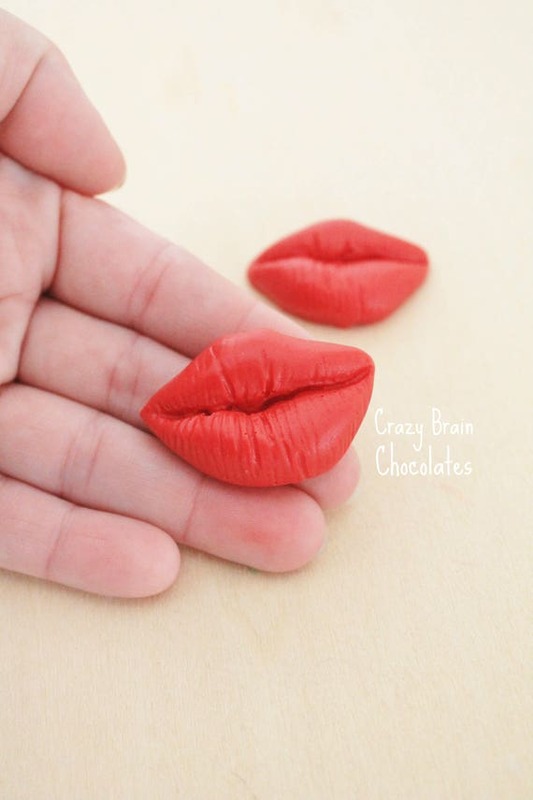 These bite-size solid chocolate lips would make great cupcake toppers or served alone on a platter. 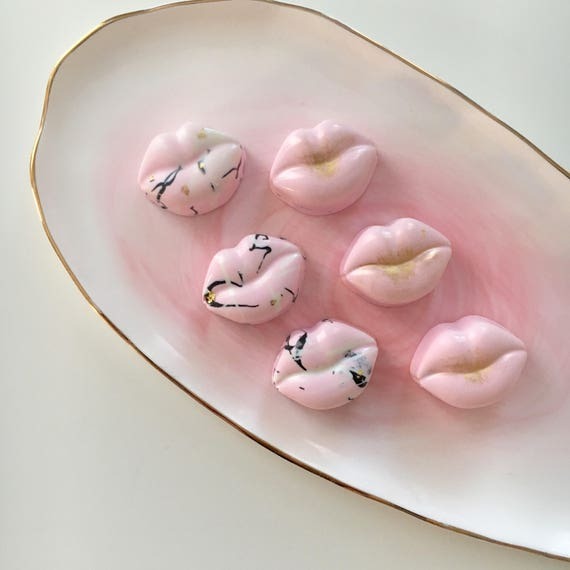 Each lip is 7/8″ L x 1 1/4″ W x 1/4″ H.
Everyone loves sweets and an order of these Kiss-Lips Chocolate Cupcake Toppers will be a huge hit with everyone attending your party or function! Our cupcake toppers are made with a high quality chocolate in the color of your choice. 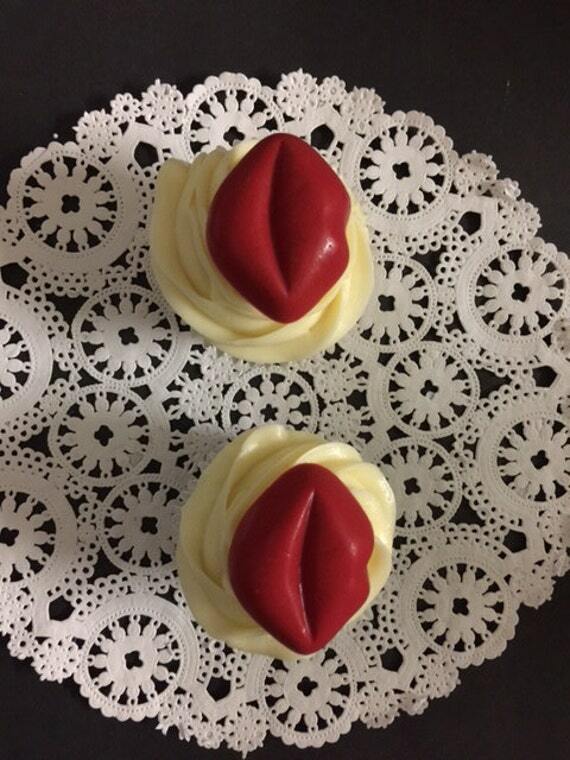 Each order comes with a dozen (12) Solid Chocolate Lips, freshly made when you order! Treats come individually wrapped in plastic wrap. This listing is for 1dzn lip shaped “cookies n cream” chocolates. 6 marbled with small touches of edible 24k gold detail and 6 blush with edible gold shimmer. Unless otherwise specified. 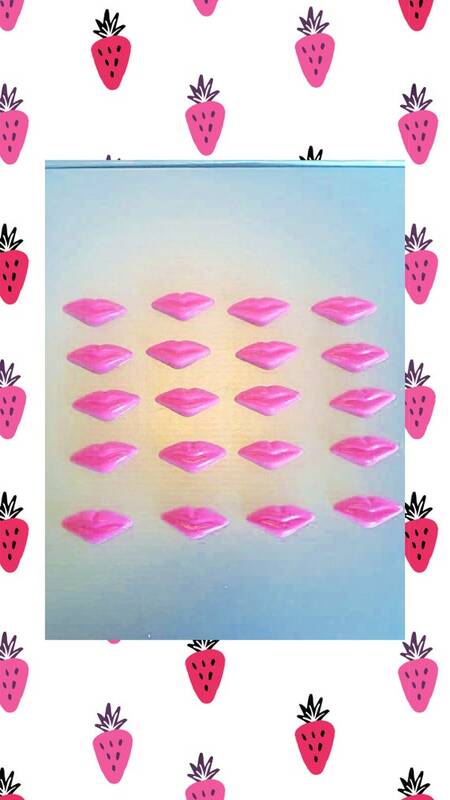 Give your Valentine a special kiss….with these candy lips! 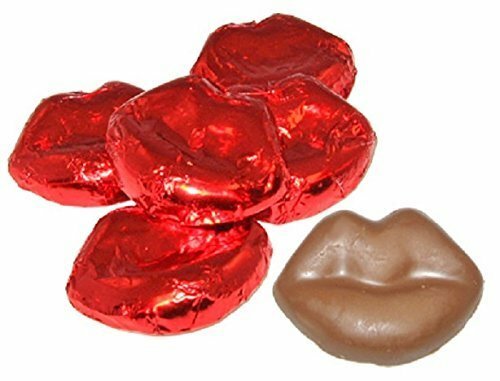 These are bite-size solid chocolate lips perfect for topping off your cupcakes or they can be served alone. Each lip is 2 1/2″L x 1 5/8″ W x 1/2″ H.